While there are military successes and failures, there are also military blunders. When it comes to war, there’s no room for error because often times, it’s a life and death situation. Unfortunately, errors are sometimes unavoidable. Whether mistakes, bad planning, or carelessness, military blunders have massive repercussions. Take a look at the biggest military mistakes throughout history and just how damaging they were to a military’s war effort. 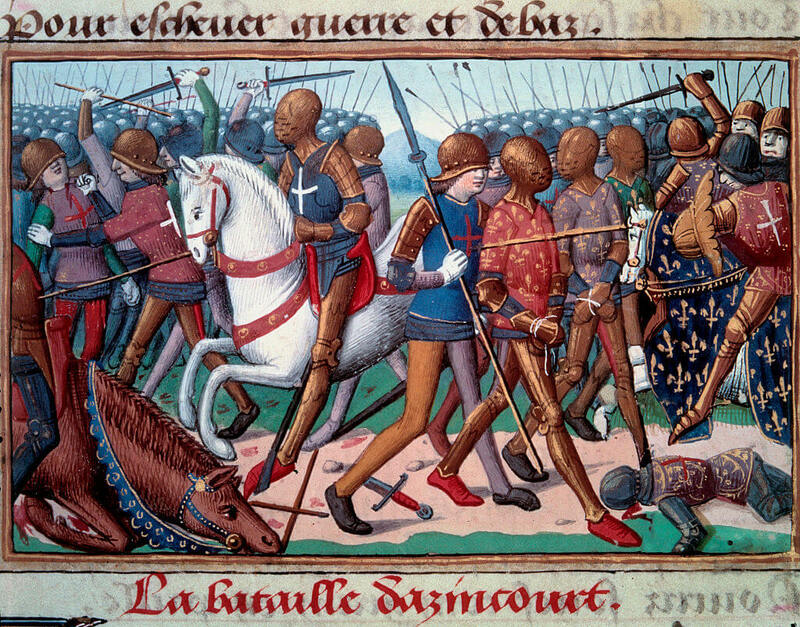 The Battle of Agincourt was like the story of David and Goliath. In 260 BC, the Chinese state of Qin, led by Zhao Kuo was attempting to siege the fortress of Shangdang, which was being held by general Bai Qi. 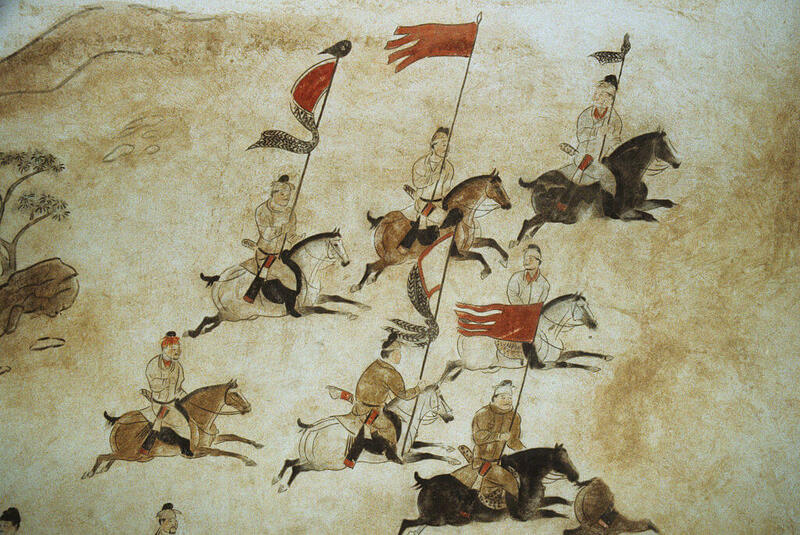 In an attempt to end the siege once and for all, General Zhao Kuo led an army of 450,000 men to overrun the fortress. As Bai Qi’s troops began to retreat, Zha Kuo sent his whole army after them to crush him, leaving his supply trains behind unguarded. Bai Qi’s cavalry, in turn, destroyed the supply train, leaving the army with nothing. Zhao Kuo was killed 46 days later in a failed breakout attempt, and his entire army surrendered due to starvation. Instead of granting the army pardon, Bai Qi had all the men, up to 400,000 executed. In 1415, King Henry V, with an English army of around 8,000, was marching in northern France when they were confronted by a much larger French army of around 30,000. The English army was fatigued, sick, and hungry. All the French had to do was block off the English from moving forward. However, the Englishmen taunted them to the point that the French performed a full-on charge. The English longbows were far superior to those of the French, and the battlefield was wet and muddy. 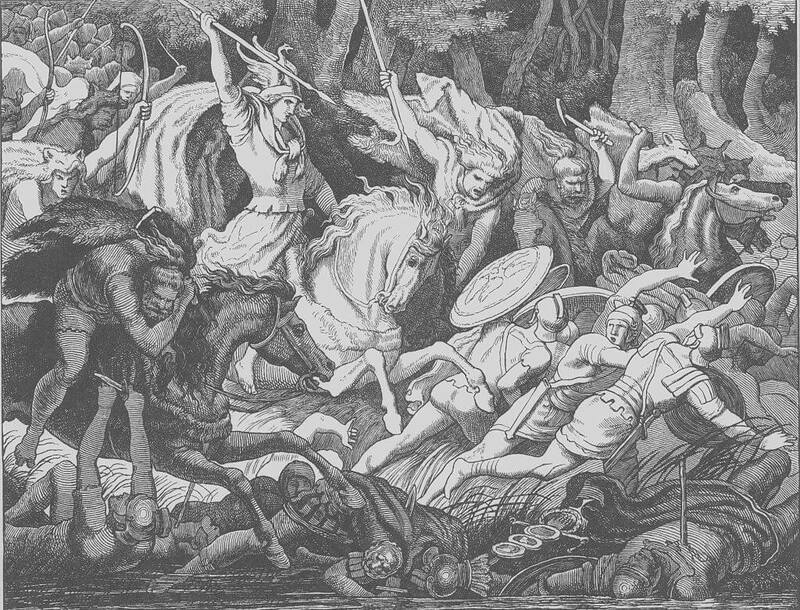 As the French attacked and became stuck and disorganized in the mud, they became fodder for the English archers. The English crushed the French and won the battle. In total, around 6,000 French soldiers were lost while the English only lost around 400 men. 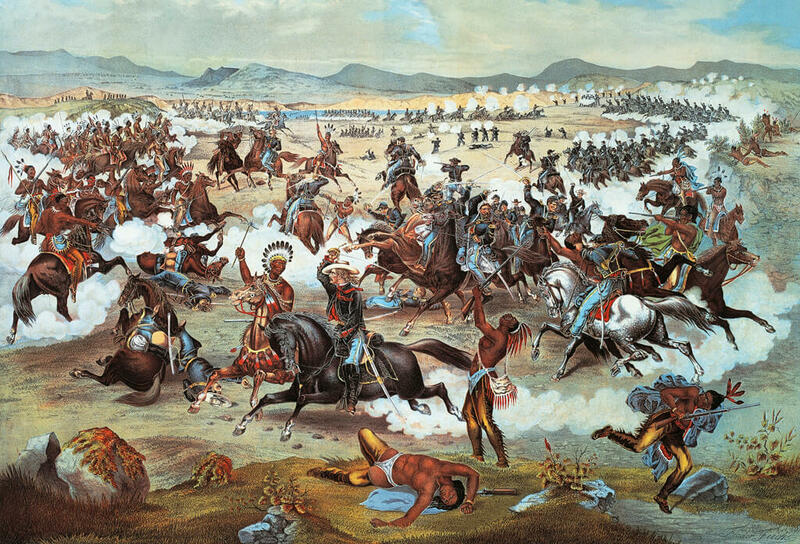 Do you actually know what happened at Custer’s Last Stand? In 1812, the French Emperor Napoleon led an army of around 680,000 Frenchman and allies in an invasion of Russia. The armies warred for three months until the Russians eventually retreated. Napoleon then took Moscow, yet the Russians refused to let up. Napoleon’s army was direly low on supplies and decided to head back the way they had come to regroup and find supplies. However, on the way back, there were no supplies to be found, and the army was caught in a bitter winter. 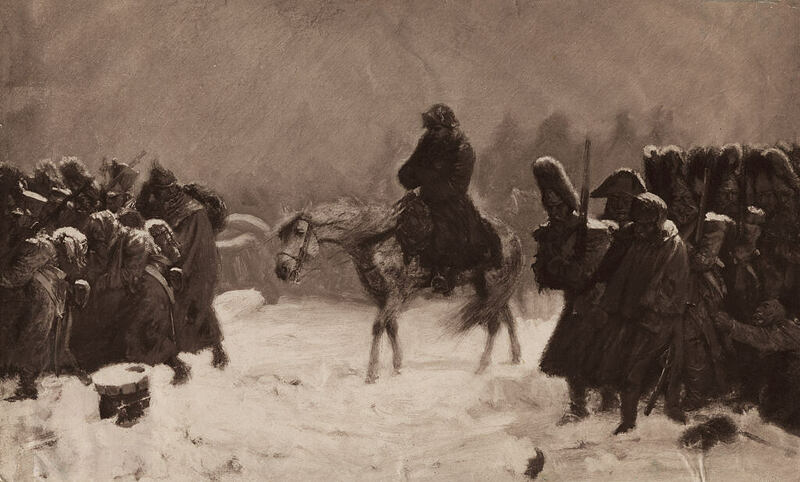 Without adequate clothing and supplies, Napoleon’s army was devastated by the conditions. By the time they had left Russia, 380,000 of his men had died, 100,000 had been taken as prisoners, and more than 50,00 were unfit for service. In 217 BC, Hannibal, a Carthaginian commander, and conqueror was moving his army in northern Italy in preparation for a war against Rome. The Roman commander Gaius Flaminius Nepos went out to meet Hannibal for battle, yet Hannibal’s army had eluded him. At one point, Flaminius’ army caught up to what looked like the rear of Hannibal’s army. 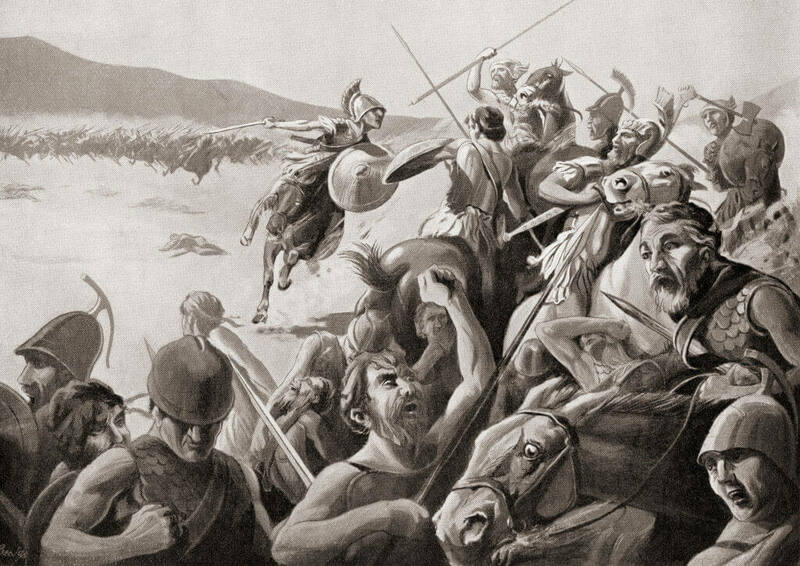 Without hesitation, Flaminius sent his entire army to attack. Unfortunately for Flaminius, everything had been staged, and Hannibal’s main arm was actually hiding in the surrounding hills waiting to ambush Flaminius’ troops. It was a slaughter with Flaminius losing his life, over 15,000 of his men killed, with thousands captured. In 1187, the Muslim leader Saladin laid siege to the Crusader fortress of Tiberias. To save Tiberias, King Guy of Jerusalem gathered a large Crusader army at Acre. His advisors recommended that they attack Saladin’s supply train, however, Guy considered this to be cowardly and not something that a noble king would do. Instead, he chose to march directly across the desert to reach Tiberias. However, Saladin’s army had blocked the access to fresh water and set fire to all of the shrubberies. 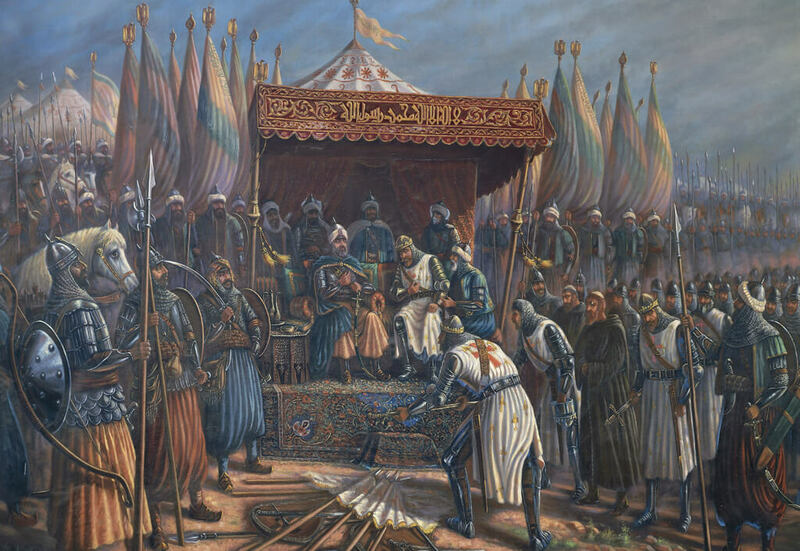 Once the Crusader army was weakened and slow, Saladin attacked and either killed or captured the entire army. In 1876, United States Luitenant Colonel George Custer led the 7th Cavalry Regiment, comprised of 647 men against an encampment of Sioux, Cheyanne, and other tribes that were camped on the Little Big Horn River. Custer had planned for the attack to be a surprise by attacking from all sides, but the plan backfired. The tribes knew that Custer was coming, and waited for his attack. 210 of Custer’s men were separated and overwhelmed, while the rest of the troops were pushed back. In all, General Custer lost both his life and the battle because he had decided it was wise to divide his forces. See which battle the English still give Spain a hard time about. In 53 BC, the Roman general Marcus Licinius Crassus used an army of around 45,000 men to invade the Parthian empire. Upon hearing that the Parthian army was busy attacking Armenia, Crassus marched his army to capture the cities of Mesopotamia. When Crassus arrived at the town of Carrhae, there was a force of 10,000 Parithiam calvaries commanded by Surenas waiting for him. Crassus didn’t want Surenas to escape, so he ordered an immediate attack instead of allowing his men to camp and rest before the battle. By this time, the Roman army was weak for such a fight and was eventually overwhelmed by Surenas. When Crassus went to offer peace terms, he was murdered along with half of his army killed and 10,000 sold into slavery. 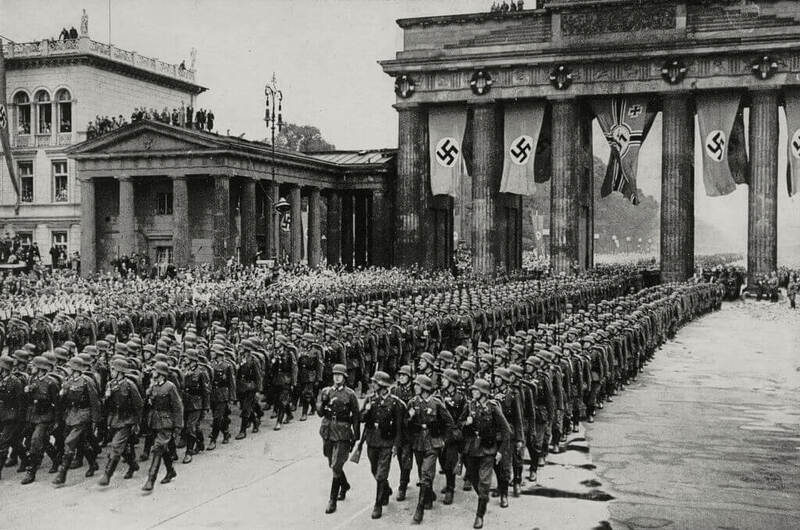 During the summer of 1942, the Nazi army, along with some of their allies, led an arrack on the Soviet Union on the Eastern Front of World War II. Their goal was to obtain the oil fields of Caucasus and mining areas of the Don and Volga Rivers. During their push into the Soviet Union, Hitler also decided to capture the city of Stalingrad to protect their flank. However, taking Stalingrad wasn’t that easy, and Hitler was forced to send reinforcements. By doing so, he separated his forces; they were soon defeated by a Russian counteroffensive, causing Hitler to lose 330,000 men. 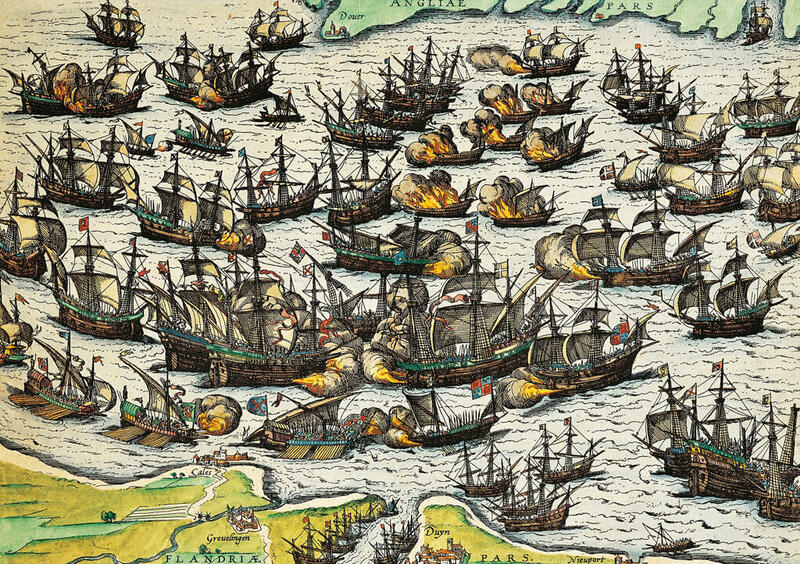 In 1588, Spain launched what was considered to be an invincible armada of ships to invade England. They were extremely confident in their attack considering the technology and number of their ships. On July 21, the English began a counter-attack by firing at the Spanish Armada from a safe distance with their superior cannons. However, when the armada continued approaching, the English sent eight burning ships towards the fleet. This forced the Spanish to unanchor and retreat into open waters which was a huge mistake. The armada became disorganized, which the English capitalized on. The English then came in with their superior guns and faster ships and defeated the Armada after an eight-hour battle. It was a highly embarrassing loss for the Spanish and is remembered as one of the greatest naval battles of all time. Rome’s biggest defeat was because of a commander that wouldn’t heed warnings. 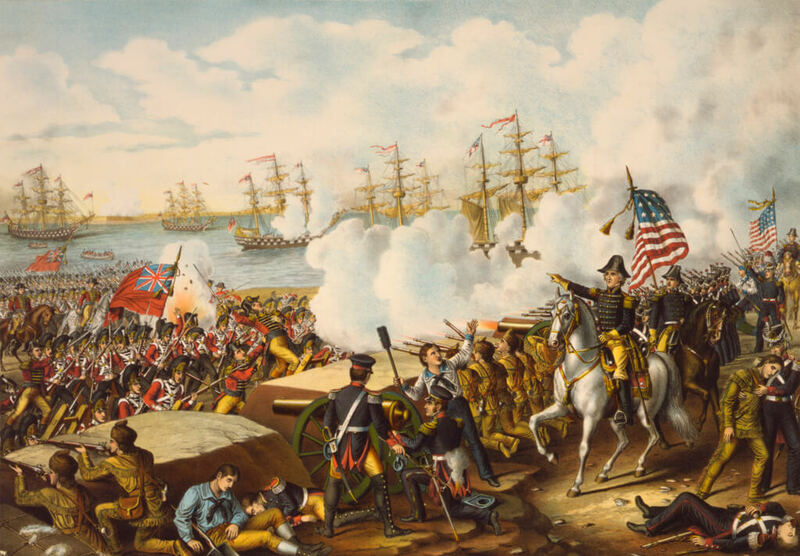 The Battle of New Orleans occurred two weeks after the end of the War of 1812. However, news that it had ended had not reached the British troops preparing to attack the Gulf coast. On January 8, 1815, an army of 7,500 British soldiers under Sir Edward Pakenham marched on New Orleans. 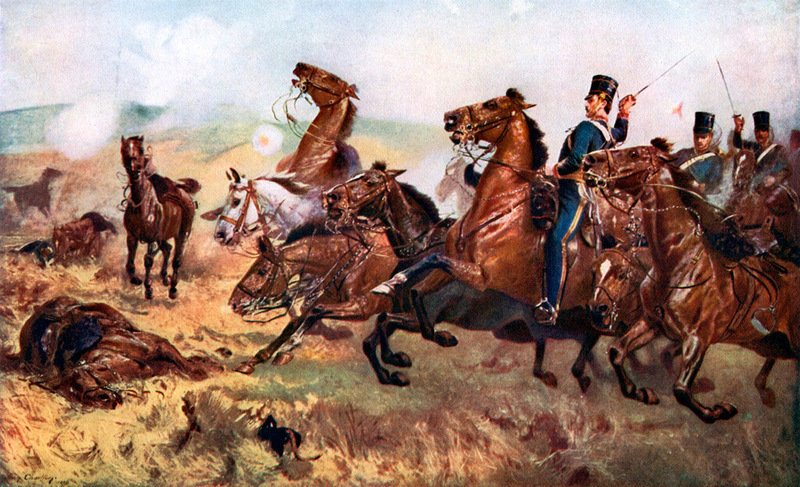 Under Andrew Jackson, the American army of only 4,500 waited for the British to engage. During the charge, Sir Edward Pakenham had his soldiers hold their fire for a little too long, and the American soldiers decimated the troops in a half an hour. During the fighting, only eight Americans were killed while the British lost 2,000 including Sir Edward Pakenham. In 636 AD, Khalid ibn al-Walid led an army of 40,000 Muslim Arabs to raid in the southern provinces of the Byzantine Empire. 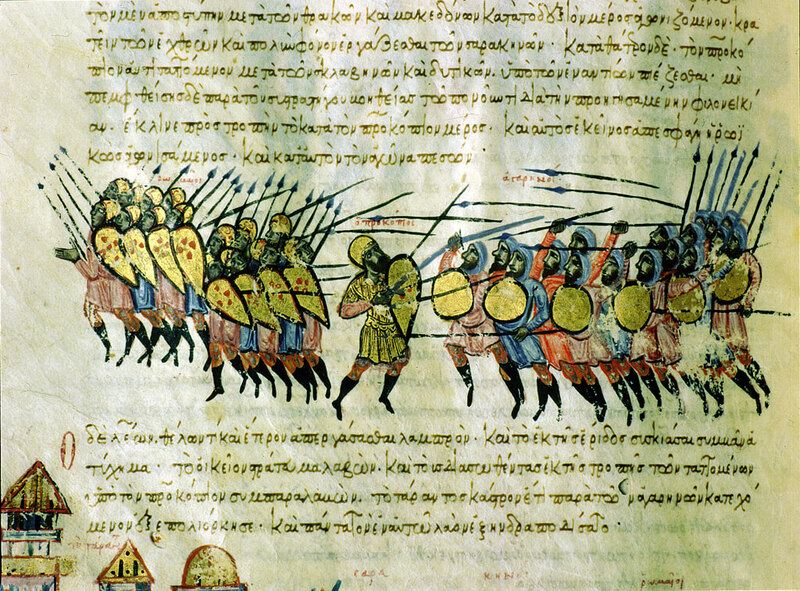 In response, the Byzantine sent the commander Vahan with an army of 100,000 men to stop the invasion. Vahan eventually found the Arabs at Yarmouk and ordered an attack. Yet, Vahan and his second-in-command named Trithyrius didn’t trust each other, and neither of them wanted to send in all of their troops for fear of being betrayed by the other. After five days of heavy casualties, Vahan and Trithyrius were attacked by the Byzantines and the two commanders lack trust once again led to losing the entire army. In September of 9 AD, Publius Quintilius Varus was leading three Roman legions along with their auxiliaries and other civilians through the Teutenberg Forest. During his travels, he had been warned by numerous German nobleman that a man named Arminius was planning to ambush the army. Varus ignored these warnings and continued on. What he didn’t know was that Arminius had a Roman citizenship, and received a Roman military education. This way, he knew exactly how the Romans would react to an ambush and how to defeat them. 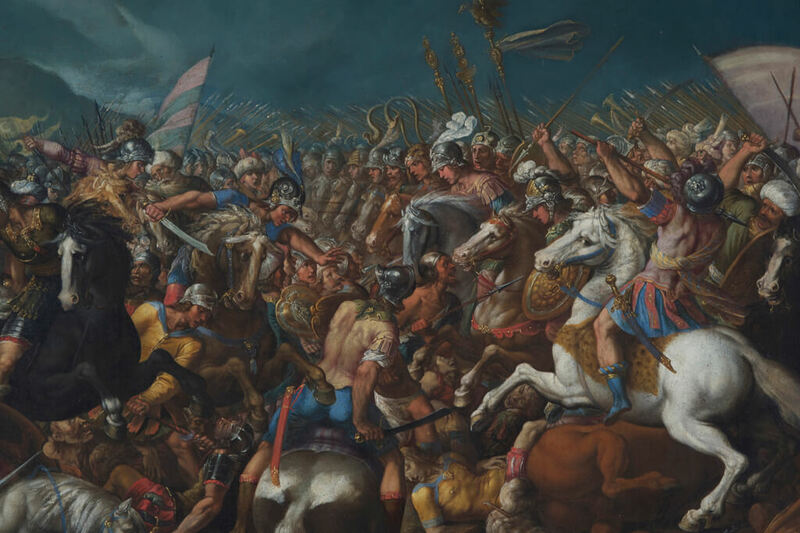 Sure enough, in the tight confines of the Teutenburg Forest, Arminius led an army of Germanic tribes and ambushed the army, slaughtering everyone. This is considered to be Rome’s greatest defeat and changed the course of Roman history. Robert E. Lee sent thousands of men to their deaths for no apparent reason. 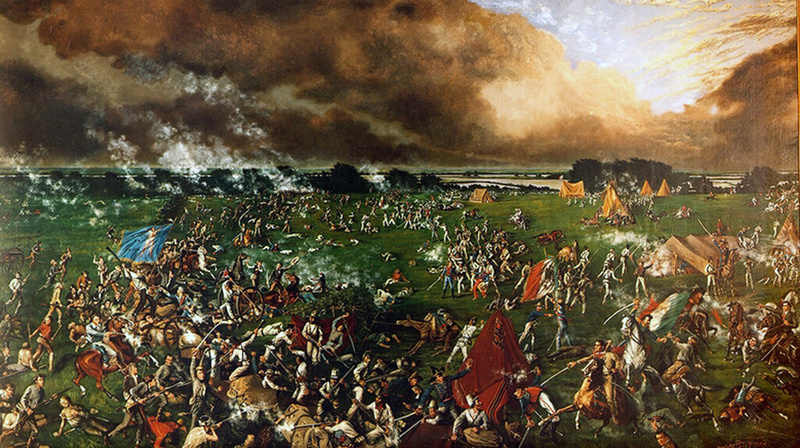 On April 21, 1836, during the Texas war for independence, the Texas Militia launched a surprise attack on the forces of Mexican General Antonio Lopez de Santa Anna. Within 12 minutes, the Texas militia had defeated de Santa Anna’s army regardless that they were outnumbered. However, the reason for such an overwhelming defeat was that General Antonio Lopez de Santa Ana had ordered his troops to take a siesta, or nap, which allowed the Texans to sneak up on the army and overwhelm them. The defeat led to de Santa Anna signing a treaty recognizing Texas’ independence in return for his freedom. The Charge of the Light Brigade was a charge of British light cavalry on Russian forces during the Battle of Balaclava on October 24, 1854, during the Crimean War. Lord Raglan, the commander of the British forces meant to send the light brigade to protect captured weapons from the Russians. Unfortunately, there was a miscommunication and the brigade was sent into a full-frontal assault where they came face-to-face with a fully dug-in and prepared artillery battery. The British suffered catastrophic amounts of casualties and those who survived were forced to retreat. Although the brigade understood the certain outcome of their charge, they continued to do so anyway. During the Han Dynasty in early 200 AD, a spy infiltrated the ranks of the northern Chinese warlord Cao Cao. The spy eventually became one of Coa Coa’s personal advisors and had earned his trust. While warring with the southern warlords Liu Bei and Sun Quan, Cao Cao’s spy turned advisor recommended that Cao Cao chain his navy together in order to prevent seasickness. Trusting his advisor, he chained his ships together stem to stern. 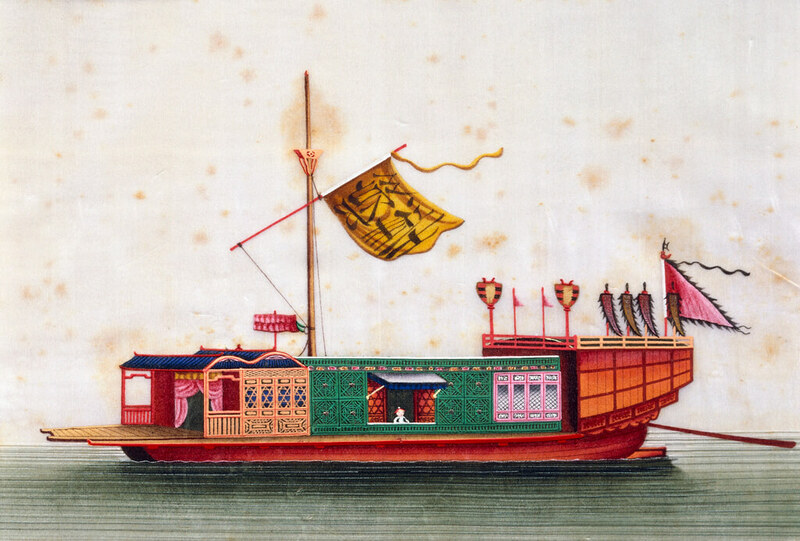 While traveling upriver, the southern forces floated ships that were on fire toward Cao Cao’s army. Chained together, Cao Cao’s navy was destroyed and his army defeated. Pickett’s charge was an infantry assault that was ordered by Robert E. Lee of the Confederacy during the American Civil War. 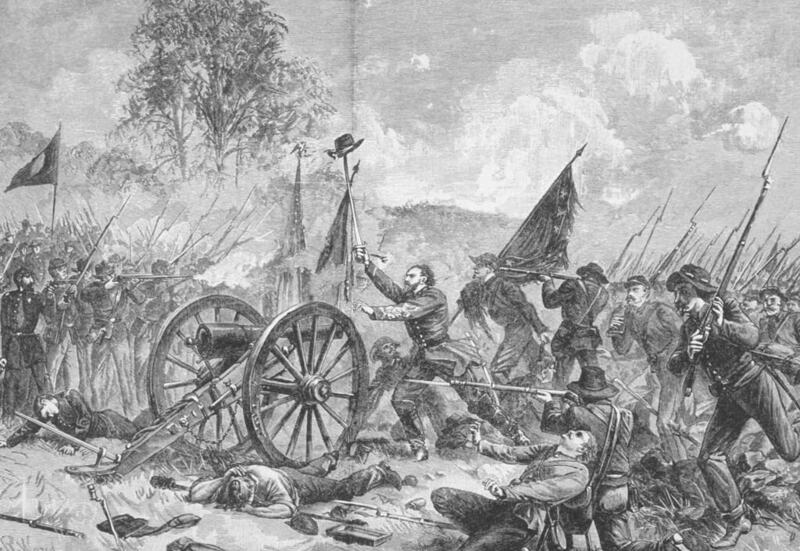 The charge was led by Major General George Pickett on July 3, 1863, on the third and final day of the Battle of Gettysburg. The charge was supervised by Lieutenant General James Longstreet of the Confederacy although he did not always agree with Lee on the war tactics they used. The charge resulted in 50 percent of casualties out of 12,500 men and was a decisive defeat and cost the Confederacy the battle. It has been described as the most avoidable mistake from the Southern war effort which they never recovered from. Check out which military sent candy instead of bombs. During the Cold War, Fidel Castro had overthrown Cuba’s American-backed president General Fulgencio Batista and successfully took over Cuba. 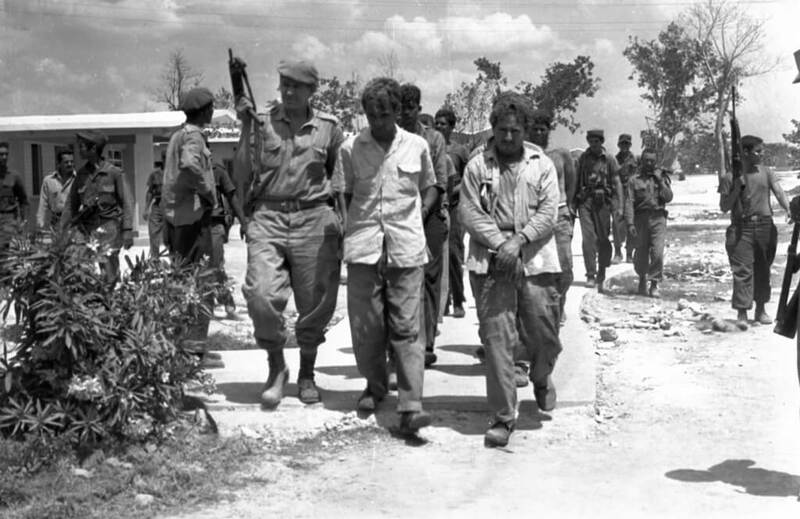 The United States then devised a plan to take Castro out of power and stabilize Cuba once again. So, the CIA ordered a top-secret plan to have a 1,400 American-trained Cubans sneak into Cuba and overthrow Castro. However, the invasion did not go as planned, and Castro’s troops greatly outnumbered the 1,400 fighters sent by the United States. After just 24 hours of fighting, 114 were killed, and the others were taken as prisoner. When the British Parliament was dissolved in 1625, the Duke of Buckingham ordered a naval conquest on Spain. He wanted the conquest to be comparable to the success of the naval conquests during the Elizabethan era. 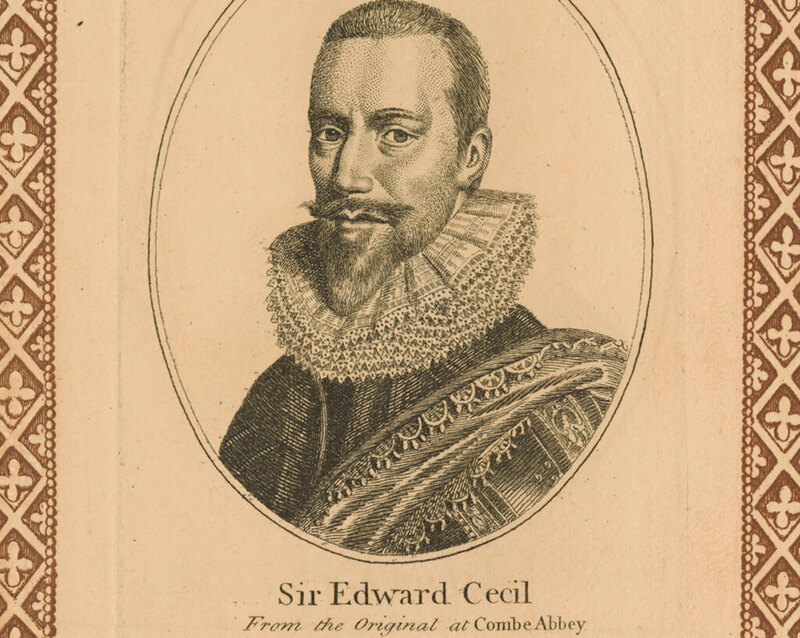 Sir Edward Cecil was in charge of the conquest and set sail with 100 ships and over 10,000 men. Unfortunately, they had insufficient supplies, which led them to raid the port city of Cadiz. During the raid, the soldiers pillaged the ports wine supply and overindulged. Before the ships even reached Spain, the drunken troops had given up on the conquest and threatened a mutiny against Sir Edward Cecil. Eventually, Cecil managed to get everyone back on the ships before setting sail back to England. 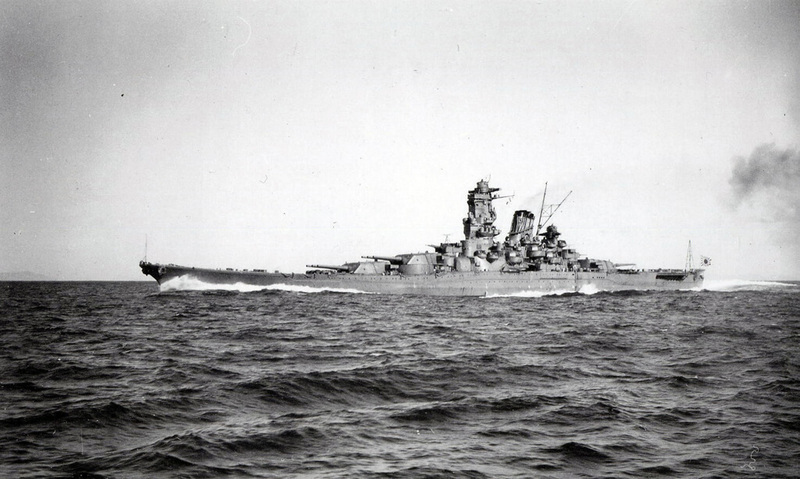 During World War II, the Japanese began building what they call the Yamato. The Yamato specific type of heavy battleship with each one being able to carry 72,000 tons on a full load. During this building phase, the Musashi was commissioned and was the second heaviest battleship in history. The Japanese military had high hopes for the ship and wanted to get it in the water as soon as possible. When placing it in the water, it caused a four-foot tsunami in the Nagasaki harbor, which flooded the surrounding buildings, rivers, homes, and even capsized other boats. If that wasn’t problematic enough, their plan backfired, and the Musashi didn’t even make it through the war. 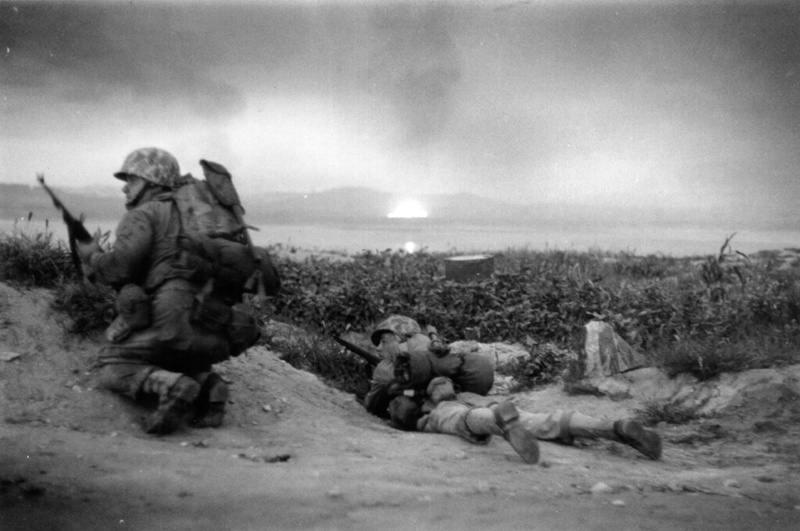 During the Korean War, the 1st Marine Division was pinned down in the Chosin Mountain Reservoir. The marines were around 15,000 strong. However, they were facing an oncoming Chinese army of about 120,000. In addition, they were in below-zero temperatures, causing their rations to freeze. When putting out an order for resupplies, someone ordered “tootsie rolls,” the slang term for mortar shells. When the resupply was airdropped down to the troops, there were crates dropped that were full of the tootsie roll candy and not mortar shells. This put the marines in a terrible situation because what they needed was ammunition to defend themselves, not candy. Next up: learn about some unbelievable weapons of war. Did you know these existed? The United States Navy is the largest and most powerful navy in the world. With a reputation like that, you can bet that they have some of the most intense weapons in their arsenal. Much of the Navy’s weaponry has been in development for years, and even the most sophisticated artillery is still improving. From nuclear war deterring missiles that can be launched from covert submarines to laser-guided missiles that almost never miss their mark, these weapons were unthinkable only a few decades ago. Wait until you see the missile that has the power to take out a small country. This is a Trident II D5 missile launching from an Ohio-class submarine. The Trident II is a ballistic missile capable of deterring nuclear warfare. Twelve independently-targeted nuclear warheads can fit into one missile. The warheads are called MIRV, which stands for multiple independently targetable reentry vehicles. 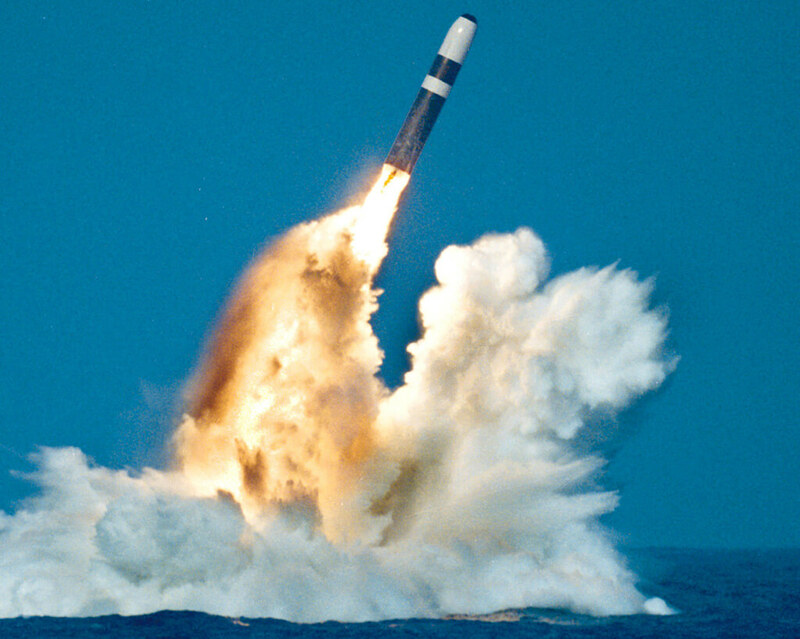 Trident missiles get launched from nuclear-powered ballistic missile submarines, which can carry up to 20 missiles. The missiles are powerful enough to take out an entire small country. Fourteen U.S. Navy Ohio-class submarines currently carry these missiles. Which surface-to-air missile uses infrared technology to increase its precision? Keep reading to find out! 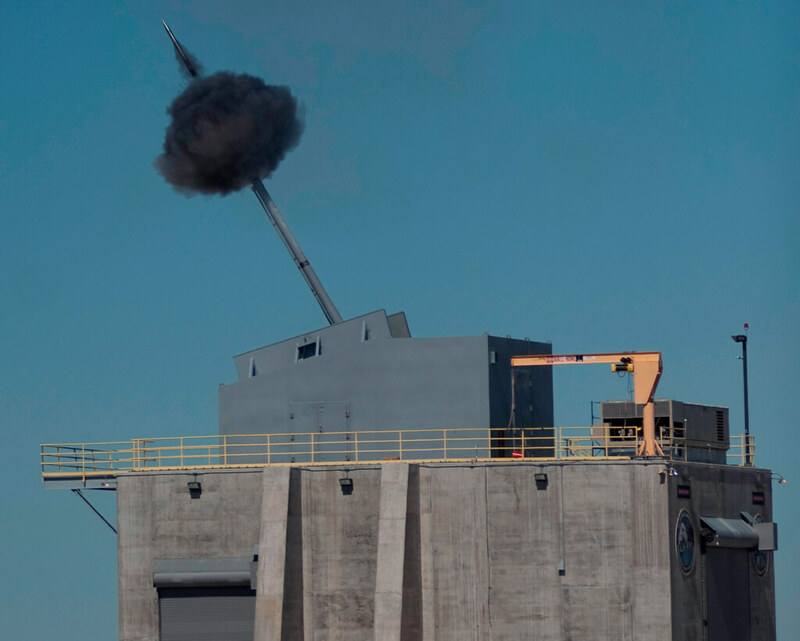 Dubbed the “future of naval combat,” the Electromagnetic Railgun (EMRG) was made to replace all powder guns on naval ships. This EMRG is so fast; this is a frame taken from a high-speed video camera. It fired at 10.64 megajoules with a muzzle velocity of 2520 meters per second. 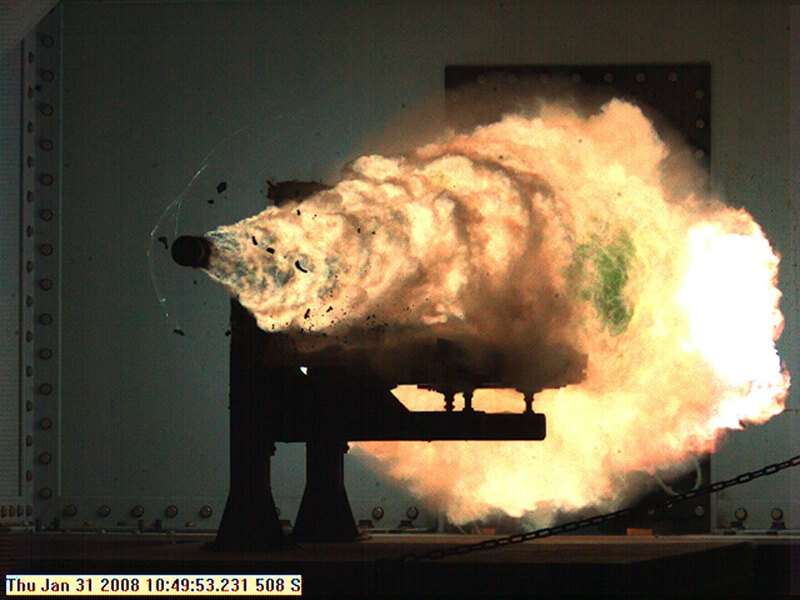 With the power of kinetic energy, an EMRG uses electromagnetism to fire projectiles at speeds up to 5,600 mph. The Department of the Navy invested a lot into their EMRG program to help develop technologies that will aid the Navy and Marines out in combat. 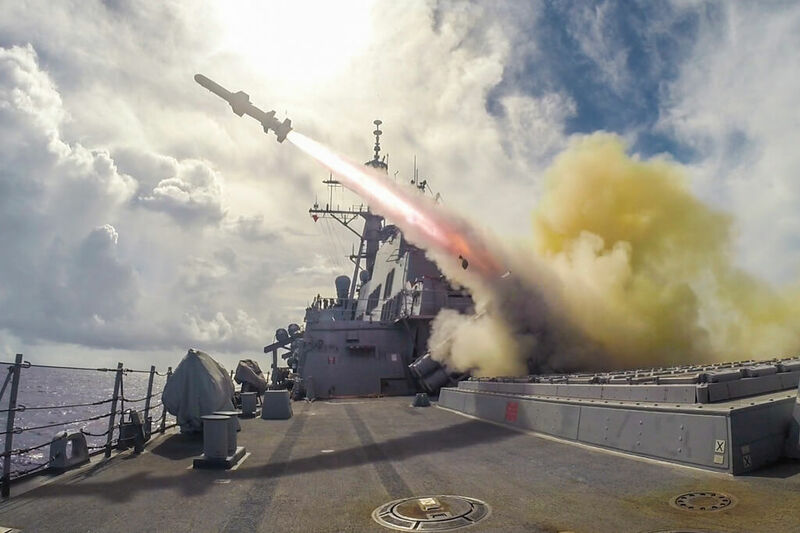 This Harpoon missile fires during a drill aboard the USS Fitzgerald near Guam in 2015. 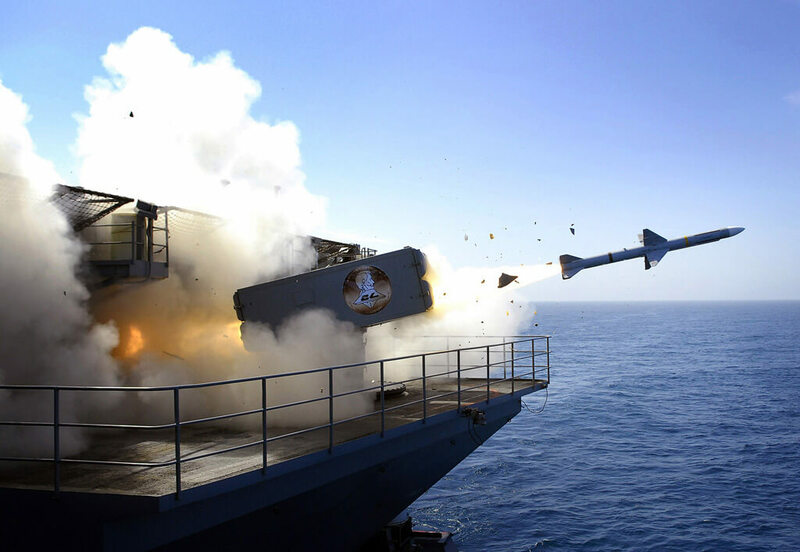 The Harpoon is an anti-ship missile system created in 1977 to serve as the Navy’s go-to anti-ship missile. These all-weather missiles go over the horizon with a range over 67 nautical miles. They can launch from coastal batteries, aircraft, surface ships, and submarines. Manufacturing just one of these bad boys costs up to $1.2 million, and Boeing currently produces them. Though they were made as a primary missile launcher, they’ve since advanced into one of the most versatile weapons used in the Navy. 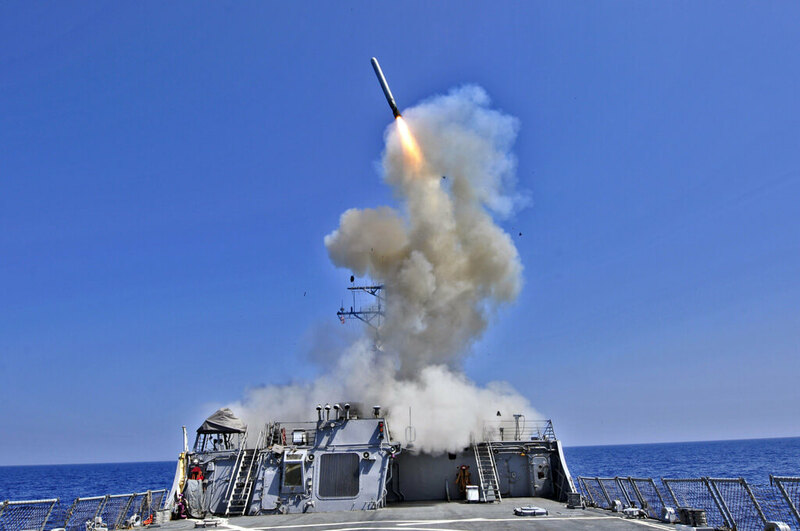 Tomahawk cruise missiles launch from ships and submarines for land attacks. These long-range missiles shoot at subsonic speeds up to 550 miles per hour to a range of up to 1,350 nautical miles away. Guided by GPS, these missiles can be controlled from halfway around the world. In this photo, a Tomahawk missile launches from the destroyer USS Barry during Operation Odyssey Dawn in 2011. The mission was a response to the Syrian regime’s alleged chemical weapons attack on its own people. Multiple U.S. ships set up position in the Mediterranean Sea for a possible land strike. 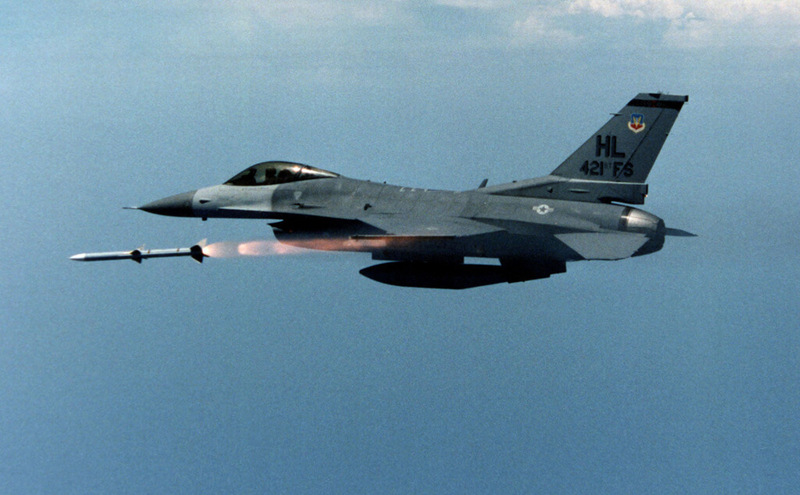 AIM-9 Sidewinder missiles are the missile of choice when it comes to aerial “dogfights.” Developed by the U.S. Navy in the 1950s, these effective air-to-air missiles have since been added to the U.S. Air Force’s arsenal as well. 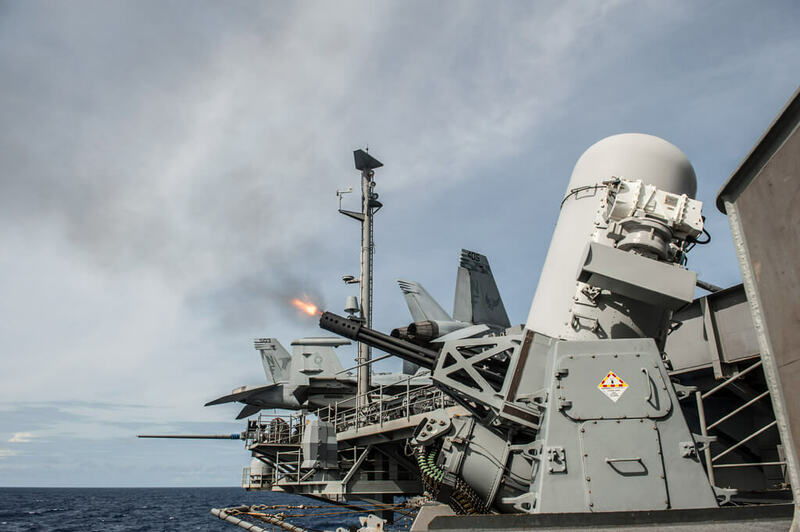 In this 2015 photo, an AIM-9 Sidewinder missile launches from the wing of an F/A-18F Super Hornet during a missile exercise above the Philippine Sea. According to reports, of the over 110,000 missiles that were made for the U.S. and 27 other nations, only one percent of them saw actual combat. In this photo, an F-16 at Hill Aire Force Base in Utah launches the first AIM-120 Advanced Medium Range Air-to-Air Missile (AMRAMM) in 1998. These versatile missiles can perform in any type of weather day or night and are used in modern warfare. Fired from the air to hit other airborne targets, these AMRAMMs are considered “fire and forget” missiles by the U.S. Navy and Air Force, which implies that they are dispensable weapons. Around 35 U.S. allies also utilize these missiles in the aerial divisions of their respective militaries. This is a Phalanx CIWS aboard the USS Ronald Reagan on patrol in the Philippine Sea in 2016. Pronounced “sea-whiz,” CIWS stands for “close-in weapon system” and serves at the U.S. Navy’s first line of defense against anti-ship missiles. This Phalanx CIWS is equipped with a 20-mm Gatling-style gun on a swiveling base, although other close-in weapon systems use other artillery such as a 22-mm Vulcan Cannon. 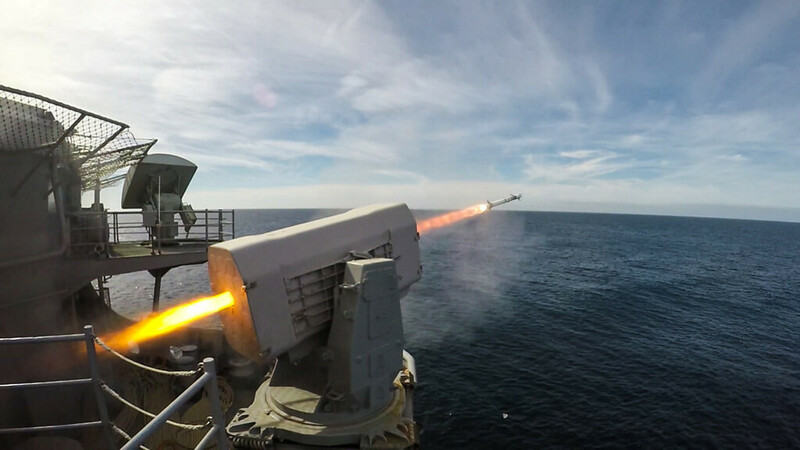 Designed and manufactured by General Dynamics, the U.S. Navy isn’t the only military to utilize the Phalanx CIWS. The U.S. Coast Guard and the British Royal Navy uses them as well. 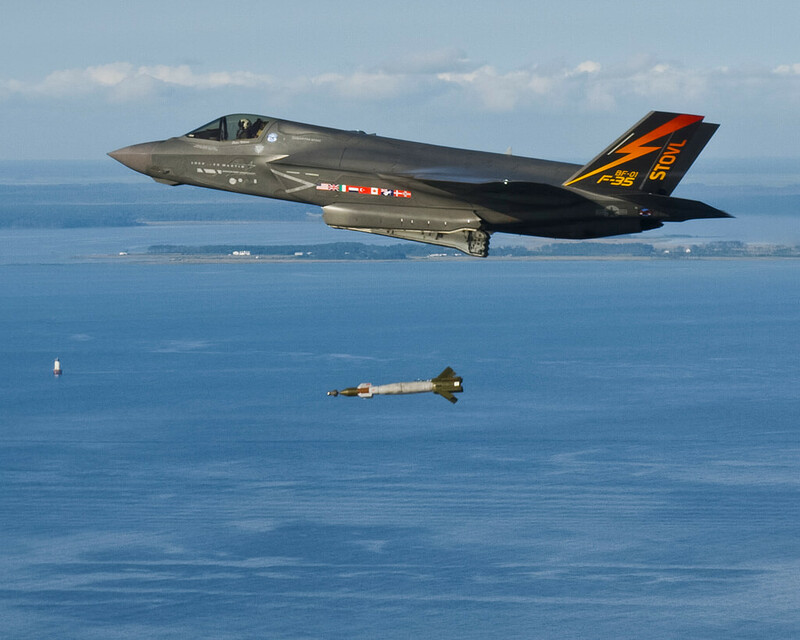 Here you have an F-35B Lightning II dropping a 500-pound GBU-12 Paveway II laser-guided weapon during a test over the Patuxent River in 2013. Raytheon and Lockheed Martin competitively produce The Paveway series of laser-guided bombs (LGBs). Paveway bombs, in particular, are converted from unguided missiles into precision-guided arsenals. Used frequently during the War in Iraq, they are launched from the air to hit land-based targets. Paveway LGBs have been used by the U.S. Air Force, as well as international allies such as the United Kingdom. This is a RIM-116 Rolling Airframe Missile (RAM) in action during a live-fire exercise aboard amphibious assault ship USS Bataan. The RIM-116 is an infrared homing surface-to-air missile. Compact and lightweight, this guy helps defend against anti-ship cruise missiles and airborne threats that are up to ten miles away. It’s called a rolling airframe missile for the way it rolls on a longitudinal axis, which helps stabilize the trajectory of the missile. Besides to the U.S., this weapon is widely used by other foreign navies including that of Germany, Saudi Arabia, Tukey, Egypt, and South Korea. There’s even a missile system that’s so accurate, its speed and range are classified! The MK 50 Lightweight Torpedo was made to replace the U.S. Navy’s MK 46 torpedo. These nuclear missiles go underwater to destroy fast submarines at extreme depths. 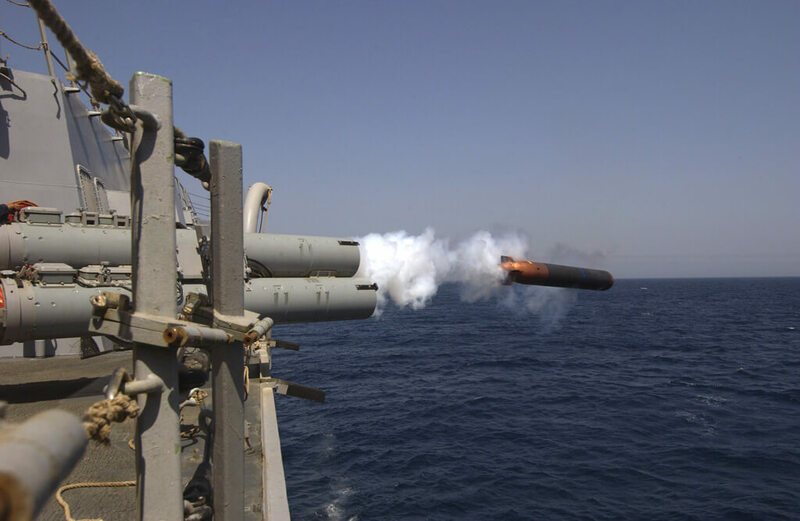 The MK 50 can launch from the air off anti-submarine aircraftor from the surface on combatant ships. Nine-and-a-half feet in length, these lightweight torpedos can also dodge any counterfire that may come its way. Here, a MK 50 launches from the USS Bulkeley, a guided missile destroyer based in Norfolk, Virginia in 2004. It was tested to help fight the global war on terrorism. 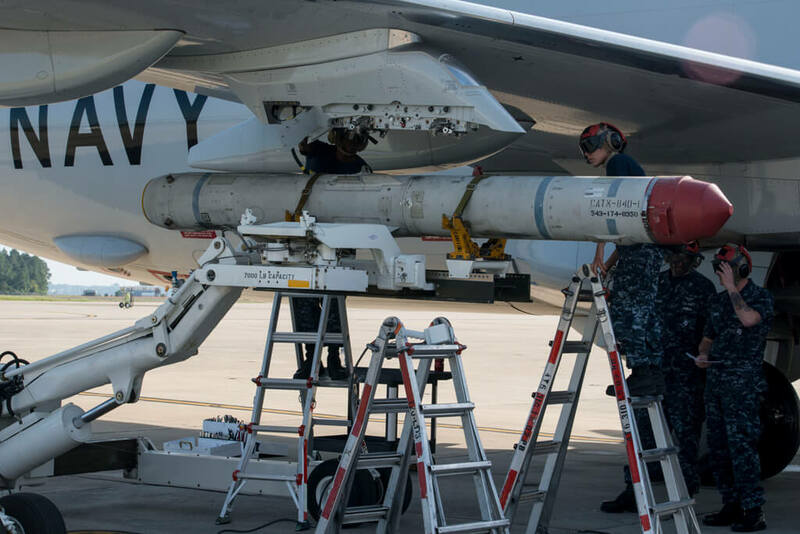 In this photo, an AFM-84K SLAM-ER is loaded onto the wing of a P-8A Poseidon in preparation for Fleet Challenge 2014 at Naval Air Station Jacksonville in Florida. SLAM-ER is an acronym for Standoff Land Attack Missile-Expanded Response. These cruise missiles get launched from the air, receiving guidance from GPS and infrared imaging to strike stationary or moving targets. Controlled in-flight, the payload can be redirected to a different target after launch. 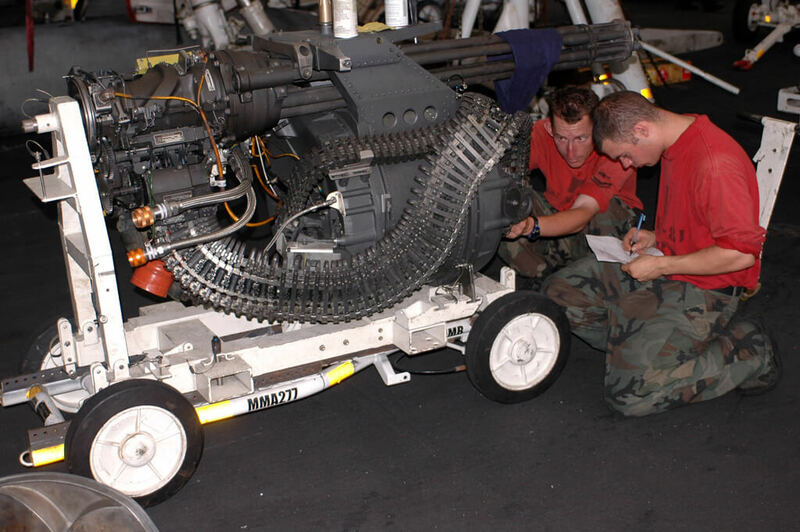 This makes the AGM-84 K SLAM-ER so precise that multiple branches of the U.S. military and their allies use them. This is a RIM7P NATO SEASPARROW Missiles launched from the USS Abraham Lincoln on August 13, 2007. The U.S. Navy tested four of these bad boys during a stream raid shoot exercise in the middle of the Pacific Ocean. They successfully engaged and destroyed two turbojet-powered drone aircraftand a remote-controlled Rigid Hulled Inflatable Boat. Meant to defend against enemy warship missiles, the exact speed and range of these missiles remain classified. Guided by radars, the RIM-7 SEASPARROW can make flight corrections through radar uplinks. Besides the U.S. Navy, at least 18 other foreign navies use this weapon. The Navy even has an army of drones that can swarm its enemies, as you’ll soon see. 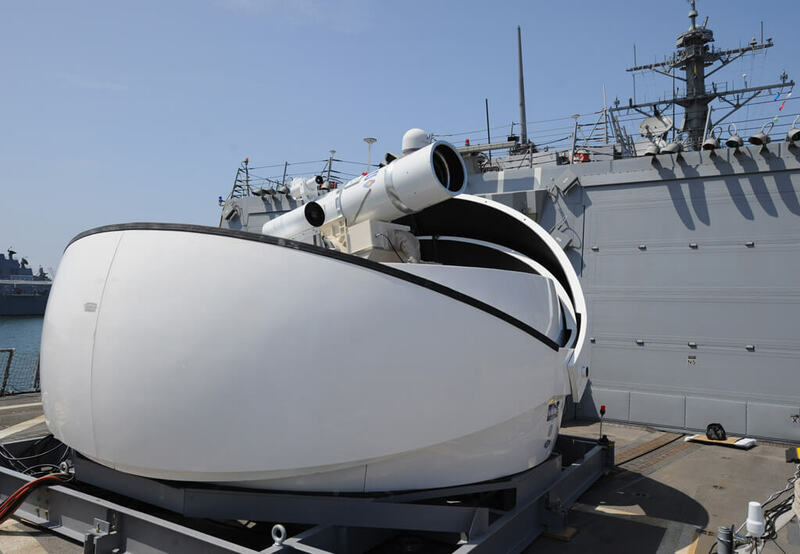 The Navy’s Laser Weapon System (LaWS) is as cool as it sounds. The LaWS emits infrared beams toward an intended target. With a capability of adjusting the intensity of the beam, the Laser Weapon System can either warn, cripple, blind, or even fry an enemy target. The LaWS was first utilized on the USS Ponce in 2014. This one you see here is installed on the guided-missile destroyer USS Dewey in San Diego, California. These weapons are useful because the Navy can take on small enemy boats and aerial targets without using any bullets. 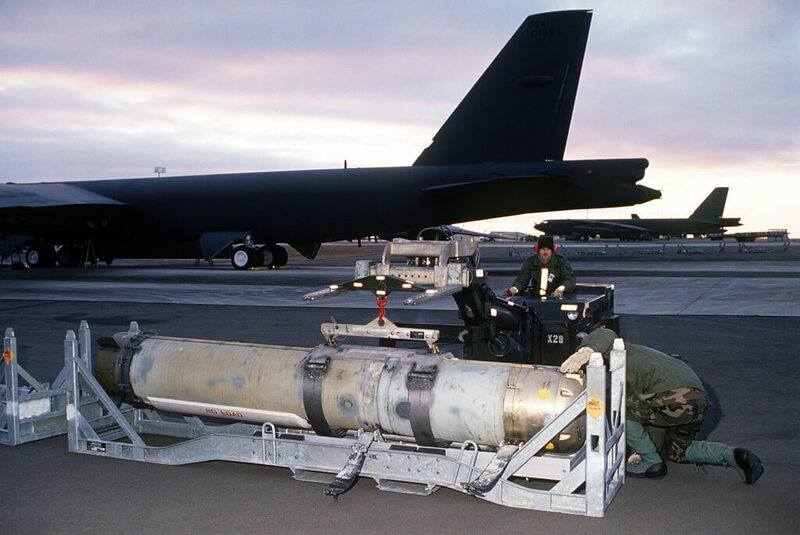 The AGM-154 JSOW (Joint Standoff Weapon) is a glide bomb created in a joint venture by the U.S. Navy and Air Force. The JSOW program replaces five older versions of air-to-ground weapons that were already in use. 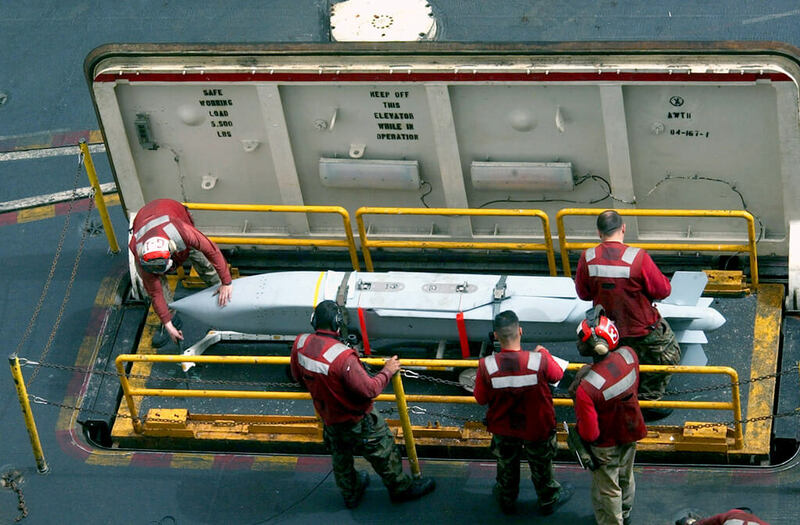 In this photo, aviation ordnance men move an AGM-154 JSOW onto the flight deck of aircraft carrier USS Kitty Hawk in 2003. Weighing 1,000 pounds, the AGM-154 JSOW attacks stationary land targets as well as moving sea targets. Using both a GPS and Inertial Navigation System for guidance, they’re intended to engage well-defended targets that are outside the range of enemy anti-aircraft defenses. 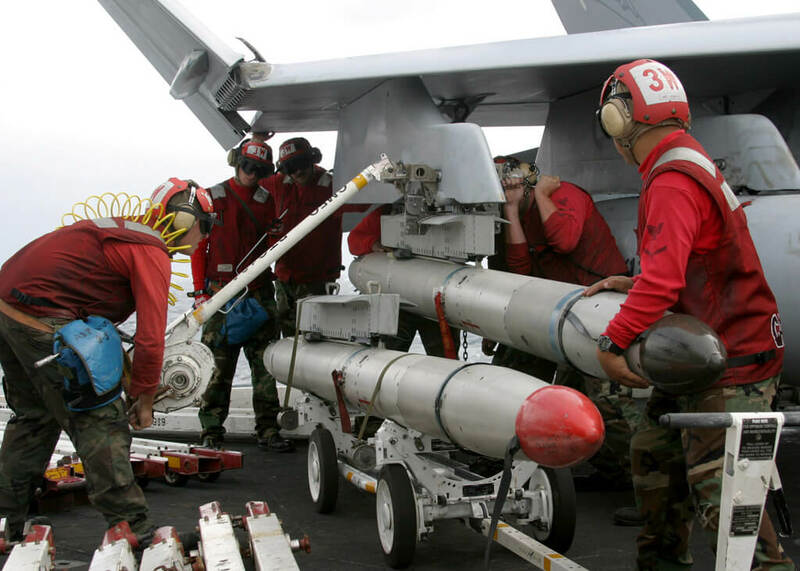 Here we have weapons handlers loading an AGM-88 HARM missile onto the wing of an F/A-18C Hornet on the USS Theodore Roosevelt in 2003. HARM stands for High-speed Anti-Radiation Missile and though they look small, can pack quite a punch. With a range spanning over 80 miles and a speed of 760 mph, these supersonic air-to-ground missiles go to work by taking out enemy air defense systems equipped with radars. The weapons can deny enemy use of radar and communications by scanning the electromagnetic spectrum and were frequently used in Desert Storm and Iraq. The Navy’s LOCUST (Low-cost UAV Swarming Technology) launchers are useful in overwhelming enemies in dangerous situations. These guys can jam enemy communications and also waste their resources by getting in their line of fire. How exactly do they do it? 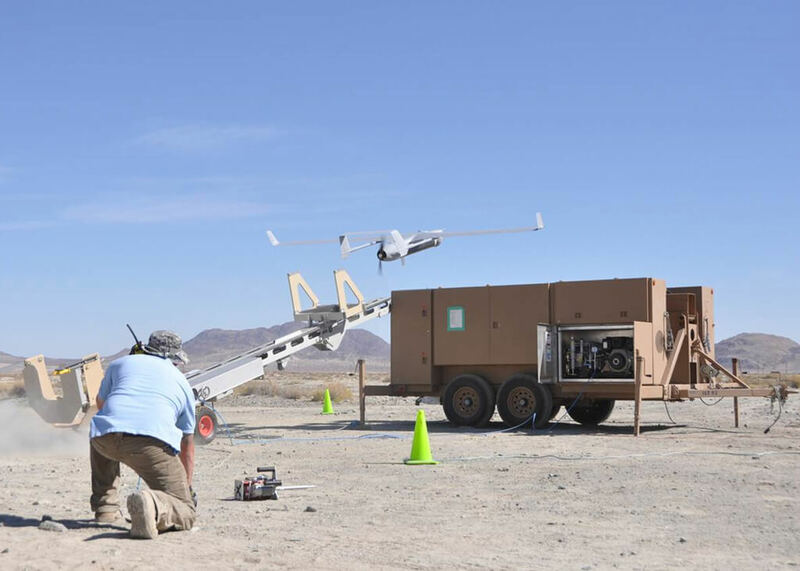 These launchers cast a swarm of up to 30 drones in just 40 seconds and can operate autonomously. Most LOCUST’s will be ship-based but can also be used from the ground and air. The low-cost to make these launchers ($15,000 per unit) makes them expendable. If you think that’s neat, wait until you see the AGS! The Navy’s aerial fleet is essential to our nation’s defense. That’s why many Navy jets are equipped with M61 Vulcans. These Gatling-style rotary cannons can fire 100 20-mm rounds per second — that’s 6,000 rounds per minute! General Dynamics currently produces these weapons. A hydraulic drive motor rotates the gun rotor, barrel assembly, and ammunition feed system, while an electric priming system is what fires the rounds. This six-barrel weapon is fast and air-cooled, prolonging its life and minimizing its corrosion. M61 Vulcans were used prominently in the Vietnam, Gulf, and Iraq Wars. This is a Mark 60 CAPTOR, named so because it is an encapsulated torpedo. The CAPTOR is an anti-submarine naval mine that can submerge into deep waters. It is the only weapon of its kind that the U.S. military has in its arsenal. Inside the CAPTOR is a Mark 46 torpedo surrounded by an aluminum shell that helps anchor the mine to the ocean floor. The aluminum casing ensures that the mine can survive for months on the ocean floor until it needs to be used. Before detonation, the torpedo emerges from the casing. In this photo, you see the test firing of an Advanced Gun System (AGS). The AGS is a naval artillery system meant to provide gunfire support for shore-based targets at long distances. Bound by a turret, each AGS is equipped with a 155-mm gun that uses ammunition specifically designed for the system. BAE Systems Armaments Systems developed AGS for Zumwalt-class destroyers, which are stealth ships that focus on land attacks. The U.S. Navy has three of these destroyers, and each is equipped with two AGS systems. No, we’re not talking about the small-bladed medical tool. 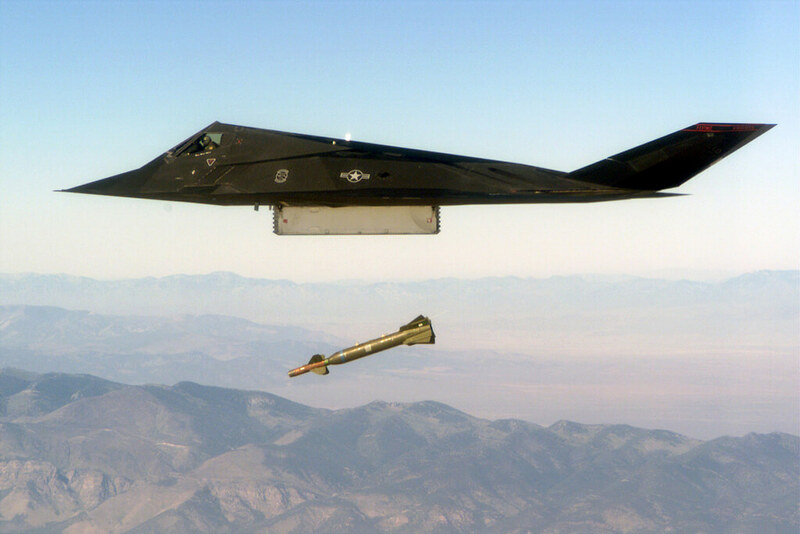 The SCALPEL is a laser-guided bomb made by aerospace defense company Lockheed Martin. The name is an acronym for “small contained-area laser precision energetic load.” The technology for the SCALPEL is similar to that found in the Paveway series of bombs. The SCALPEL uses lasers to pinpoint positions for small strikes and is designed with low-collateral in mind, which makes it useful in urban settings. In 2010, the Navy reportedly announced plans to purchase these weapons, but have yet to incorporate them into any of their arsenals.